It’s now a cliché that our society is super fast paced. There’s no time to relax. There’s no time for reading an article longer than 1000 words (this one is 737, don’t worry). Things need to be distilled into sound bites for easy ingestion. This attitude of go, go, go will not serve you well in landscape, nature or wildlife photography. While there are times you may need to bolt out of bed and hit the trail running before the sun rises, shooting natural scenes requires patience. It is something the young or inexperienced often lack and it is lesson most of us typically learn on our own. I’m hoping to cut down that learning curve for some of you getting started. Patience is important in natural photography (I’m grouping landscape and wildlife in with nature here to make for reading ease) because you are likely not in control of the scene. You have a say in where you stand and point your camera, but often the scene is unfolding at its own pace, which is different than yours. This difference is what causes impatience in most of us; wanting something to be where we want it, but it’s not, yet (and maybe never will be). This first shot was one I had in mind when I realized the sunset was not likely going to be a stunner. Clouds were forming where the sun was to go and it looked to be a pale, Puget Sound sunset. So I shot for the muted patterns of the Olympic Mountains before they dip into the Strait of Juan de Fuca. Mission Accomplished. Or so I thought. I was ready to head home as the wind was blowing and tears were rolling down my face. But I stuck it out a bit longer with the students who were with me, because I know things can change. 12 minutes later, I panned slightly to the right as the sun decided to pop out from under some clouds for a minute or two. Great color on the horizon and surely a keeper. Ok, time to go? Nope, not yet. Stick it out and see what happens one minute and thirteen seconds later when the mist in the foreground is lit on fire. You don’t need to go through that moment to understand the lesson. If you are wise. Some people need the experience but I’m hoping some of you can see the value and take it to heart before hitting your forehead a few seconds after putting away your camera. What can you do about increasing patience for natural photography? It takes the effort to introduce patience into your life in general to have it available for shooting photos. There’s no quick cure other than slowing down a bit, getting used to the quiet times in your life when the TV isn’t on and you’re not madly clicking from link to link on the internet, looking to be entertained. Meditation helps some people while others like breathing exercises. Reading at least 20 pages of a good book is also good exercise as it trains your brain to stay on one topic for an extended period of time. I’m not saying multi-tasking is not good or advantageous. There are certainly times when it is precisely what is needed. But when it comes to standing in the cold for 20 minutes waiting for a bull elk to cross a stream while the light is starting to fade from the sky, the second most important item to make sure you packed that day is patience. Wishing the elk would hurry up will never, ever help. What about you? What have you found helps you when you are waiting for a shot, or to stick around after and see what transpires? After years of digital photography, I returned this summer to 35 mm. The satisfactions are enormous! My first camera was a digital point and shoot. I just purchased a 35mm. For the sake of the point ignore quality. I went to Washington D.C. during the cherry blossom festival, I took thousands of pictures it was ridiculous. I would photograph the same scene 5,10,15 times over to try and capture that "perfect shot". Some were technically perfect , but artistically I was missing every time. I didn't realize until I used the 35 that I wasn't really "seeing". With film I only have 36 shots (one can only carry so much x-tra film). It forced me to slow down and I came to value each exposure as more precious. The results pan out, technically I'm having some hiccups, but artistically progression is notable my photos are more interesting to look at, more beautiful, and I find myself more happy about the photos I take even if they are flawed. Technique can be fixed, patience as vision must be earned. 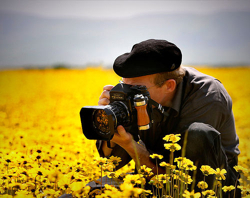 Photographing wildflowers is teaching me another dimension of patience in nature photography --- i.e. some flowers are only at their prime for a few days each summer, and they won't get there again for another year. So if it rains, the wind blows, or I just don't have time to go find a particular flower on a day when it's likely to be especially beautiful — then all I can do is make a note to try again next summer. It's frustrating. But it's also deeply satisfying. Face it ..... I just don't have that much control. Very appropriate article. I have been with people who want to run from one photo op to another without slowing down to see what is beyond their one focus. I have frequently come trailing behind with pictures of the same things they have photographed and been told "I didn't see that!". I had an experience like the one you described. We were on a tour of Bali and except for my wife and I not photo oriented people. We went to a temple for sunset and and when the sun dipped into the sky they all wanted to leave. I threw a fit and said wait as the real color is about to come out. After ten minutes the sky turned color and people started walking back to the bus. We stayed until the group got just about all the way back and just before we really had to leave the color went nuts. Got the best photos of the whole trip there. We ran back as the people were getting on the bus and they saw what the sky had done. I smiled and said, "Got it". Many wanted prints and asked me to send them one. No digital then or internet either. They never rushed me again at sunset. Thank you for the article as patience is not one of my best virtues unless I have a camera in my had. Patience is always a Human Virtue and we are slaves to time and if we follow the doctrines involved we will be rewarded. I think what everyone else has said is true, patience is a big thing to utilize when shooting nature. I think one aspect people are overlooking is being prepared for being in the same spot or out in the field for a long period of time. I love hunting and I love photography, to me they have a lot of parallels, make sure you know the weather and wildlife in your area and be prepared for what it might bring. Take a snack and something to drink if you know you are going to be out for a long time and make sure you get your restroom duties out of the way. The three biggest things why I see people get impatient with hunting is because they are either cold, hungry or need to use the restroom. I usually incorporate photography into my hunting excursions, I will scout areas on the land before the season starts with just my camera and I almost always have my camera with me when I am hunting so if i see something I don't want to shoot with my gun I will shoot it with my camera. One thing I started doing a couple years ago is looking behind me. It's great to get that awesome sunset show, but take a look in the opposite direction and see what the sunset is doing to the things behind you. You'll be amazed. The same is true for any nature photography. Always look behind you. Very true. I like to shoot wildlife from a small boat. Sit motionless and the wildlife will come. Last week, while shooting an eagle, a mink appeared about 20 feet away. I like to take advantage of the wind. Get upwind of my "target" and let the wind slowly drift me closer as I shoot. Often, I can get closer than my telephoto will focus. Time. Giving myself plenty of it when I go out into the field. It's absolutely essential that a photographer give him or herself freedom to be in the moment and place versus rushing from one scene to the next according to a predetermined schedule. You're right. It runs contradictory to what we've done to ourselves as a society. We've placed an emphasis on immediate communications, immediate response, immediate entertainment. And to what purpose ? What's really been achieved ? We've managed to build our own prison, all in the name of convenience and efficiency. Really ? Engaging in the subject of light on the landscape brings the photographic artist back home to the touchstone of the essence of why we fell in love with this particular medium in the first place. My best images are almost always those that weren't foreseen or planned. The scenes arrived to me when I allowed myself to become completely lost within the scene and in the light. To do that I had to let go of concern of other people's expectations of how I should be "spending" my time or where I should be or whether or not I'm "working" according to their limited understanding of that particular term. This takes wisdom, patience and faith - faith in knowing that what I am doing as a photographer and artist serves a higher purpose because I am engaging my inner spirit directly with the place and the moment. "When time is reduced to linear progress, it is emptied of presence." I am mostly devoted to motorsport photography and your comments are also very truly for me. However, while you can learn from experience about when come home, in motorsport, things are slightly different. Here here Peter. Such an important yet often ignored factor in Nature and Landscape photography. Great photographs, Great tips, Patience, is a virtue. Enjoying nature makes it easy to 'take it slow, quietly-you, your thoughts, scene and anticipation!!! The other half of the patience card is to get out there with the camera. I work in a state park and am on the trails three days a week. Every trail I carry some camera gear. Many weekends (I work F, S, and S) I see nothing really spectacular. But when I do just being there has paid off. Get outdoor: the first criteria in nature photography. Patience is definitely the key in nature photographer, no matter what your subject is. I do fly fishing photography, the act of catching requires as much patience as taking the photo. Erik--great shot. I can say it was definitely worth the wait for us. Nice website, as well--I'm following your feed. Thanks. Patience - applies to waiting for the sun and the light but also for people to arrive, pose or to just get out of the way. In this shot, I waited a good ten minutes for folks to get out of the frame. It allowed me to take my time, recompose and think about how I wanted this line of cars to look! I like this one a lot. I was in Boston, MA shooting a sunset over the Charles River. I was getting some good shots, but I wasn't getting what I was after. So, I decided to pack it up and head home. It took a couple of minutes to pack up my gear, and like a smack in the face there it was. I almost missed the shot because I thought the light was done for the day. So I set back up and got some great shots. When I was reading about your Puget Sound experience, I almost laughed. I was thinking, "I could have used this article back then." :) Thanks for writing it. Hopefully everyone can benefit from it. I thought you nailed it on the first shot, the muted patterns are much more evocative. I guess patience is what I miss the most in photography - I'm not saying I don't miss anything else but I really think I still keep losing lots of photos because I have no. Everyone who posted links--nice work. I like this blog! So, I would add persistence to your list along with patience. This osprey shot is my favorite of 100s of osprey photos and had I simply settled for my first few shot, I never would have been ready. I waited for hours that day because I knew that the osprey sometimes fly over "my spot." I think being passionate about nature helps. If it seems like a chore you won't take the time to make a photo. I have enough of all the rush rush at work to be rushing my photography. Nature photography clams me down, and It's fun finding dynamic scenes. All so true, and a lesson I haven't fully learned yet. Everytime a small amount of patience pays off though, it leads to a bit more patience the next time. A few weekends ago, had the opportunity to photograph hummingbirds. I spent hours with my camera glued to the area I hoped they would fly into, focus preset to a spot near the feeders or flowers. I was rewarded with a couple dozen decent results out of about a thousand shutter clicks... My brother in law, also a photographer, pointed out that this was like fishing. True, but for me, much more rewarding. My flickr page linked here has about 6 of the best images I could distill from that weekend. Could not agree more with this! My biggest problem has always been to slow down, not get too overly excited which (for me) tends to result in massive amounts of shots. I have to tell myself each time I have gone out to: slow down, figure out what I want to do with a particular scene and set up appropriately. Perhaps the most important accompaniment to patience in photography is to KEEP A CLEAR MIND. It helps me to focus on what I am looking at, how I want to capture it, and then execute based on my knowledge of the camera. Viewing the end results are more rewarding this way and really helps me learn as I look at what did or didn't work and paired that with recalling my thought process at the time. One of the most obvious times that I have talked myself into being patient was when I captured this image. I wanted so badly to just shoot and shoot and shoot and sort it all out in the end. But in the end, I waited for just the right moment as the sun was coming up providing just enough light for the fall leaves to shine and to lift some of the low lying fog (which was overpowering the shot early on). Peter--great suggestions. I've been thinking about this quite a bit lately. Sometimes I feel like I'm totally ADHD (I teach high schoolers--I must have picked it up from them). But I have the hardest time taking my time, and my photography suffers for it. I don't know how many times I've gone home, downloaded my images, and found that some simple mistake--a mistake that would have been easy to fix in the field--totally messes up my set. The latest instance involved shooting all day with my ISO set at 3200 because I forgot to change it the night before. Recently, I assisted a photographer friend who was working on a magazine shoot. I watched him closely (you can read about it on my blog at http://www.canyonartphotography.com/2011/08/5-things-i-learned-freeworking-with.html). Seeing his methodical system really opened my eyes. He obviously knew his way around his camera, quickly made a bunch of adjustments as he worked, and treated each image as a shot. He checked his work and didn't move on until he had what he wanted. Even though he was moving fast, I could tell that he was patient with his shots as well. I keep wondering what it would be like to pick a spot and spend all day photographing it. I'm lucky--surrounded by incredible landscapes and National Parks--so I've got no excuse for not taking my time. Your post was a great reminder to slow it down a bit. Thanks for your insight.